John Glover, Joel Grey, Diane Lane, and Chuck Cooper in The Cherry Orchard. Photo by Joan Marcus. BOTTOM LINE: A new version of Anton Chekhov's The Cherry Orchard tackles racial, not just class, struggles. Chekhov’s final masterpiece The Cherry Orchard gets an update in Roundabout Theatre Company’s latest production, to reflect issues relevant to contemporary American society as opposed to turn-of-the-twentieth-century Russia on the cusp of a revolution. Or at least that’s what playwright Stephen Karam (The Humans) had in mind. The Cherry Orchard, which first opened in 1904, centers on the family of aristocratic actress Lyubov Ranevskaya (Diane Lane). Ranevskaya returns to her family estate, including a brilliant cherry orchard where she has many fond memories, in the months before the estate is auctioned off to pay the mortgage. The original version follows the family's struggle to come to terms with the fate of both their beloved orchard and their own lives. Eventually the estate is bought by Yermolai Lopakhin (Harold Perrineau), the son of a former serf; the newly rich Lopakhin plans on cutting down the cherry trees and leasing the land for business purposes. In his new version, Karam resets Lopakhin's background—instead of serfdom, he now comes from a linage of slaves. As Ranevskaya, her daughters and her brother, and Lopakhin recount their upbringings on the estate, the contrast, and the roots of their conflicts, are clear. The switch, of course, changes the play's focus—what was about the rise and fall of different social classes in Russia now turns to racial friction. The sendoff of old aristocrats, and the inevitable entrance of the new middle class, was specific to the time the play was written: the state of Ranevskaya’s family is a metaphor for the old Russia being on the edge of ruin. However the accuracy, as well as the propriety, of the parallels between Chekhov's version and Karam’s remains doubtful. It is not difficult to pair up what the characters represent in each context. Lopakhin, the businessman who represents the new wave of socio-economical influence, is painted with a less sympathetic tone than Ranevskaya, the nostalgic and kind “old money” who is slowly fading out of history. Especially with Lane’s phenomenal portrayal of Ranevskaya, who is largely depicted as victim, Lopakhin by contrast becomes the villain who ultimately shatters Ranevskaya’s dream of preserving her childhood innocence. What makes him even less likable is his eventual refusal to marry Ranevskaya's adopted daughter Varya (Celia Keenan-Bolger), after years of hinting otherwise. Although it is clear that the new version is more concerned with the socio-economic shifts that are specific to America (slavery), the play is still set in Russia. America is referenced as a land of the free that takes in the poor and the tired: when Ranevskaya gives a passing panhandler a gold coin, the latter recites Emma Lazarus’ Statue of Liberty poem. It is clear which side the audience is meant to take, and which direction the unbalanced society is leaning towards. Of course, this may be the point. Scott Pask creates a brilliant set that is heavily influenced by Alexander Calder’s mobiles. The orchard—with a cluster of mobiles resembling cherry trees—takes on the perfect metaphorical imagery of a society held in balance. The nursery room of the first and last scenes also resembles a mobile, with the picture window hung from the ceiling. Michael Krass’ costumes compliment the atmosphere and also show the progression of time: the characters are in period costumes at the beginning, but by the end are in contemporary dress. The masquerade ball that begins the second act also features various clown costumes, recalling Calder’s Cirque Mobile. Karam’s dynamic writing instills specific characters with relatable modern personalities. Charlotta (Tina Benko), traditionally the governess, in this version becomes a magician. Benko’s portrayal makes her simultaneously quirky, independent, and vulnerable; this secondary character stands out as a symbol of the loneliness of someone whose life and career depends on the existence of the aristocratic class. Semyon Yepikhodov (Quinn Mattfeld) is another comedic element as the family accountant who stumbles on as an early twentieth-century slacker. Simon Godwin’s direction makes Chekhov’s monument of a play engaging, and the stellar cast brings much depth and complexity out of each character. It’s a treat to watch masters such as Chuck Cooper, Joel Grey, and John Glover. Tavi Gevinson is a perfect Anya, who, in what is ultimately a tragic story, carries hope with her optimism and liberal beliefs. 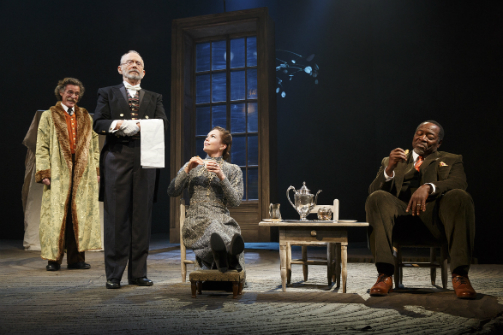 However problematic the message of this version is, from a production standpoint, Roundabout Theatre Company’s The Cherry Orchard has the quality of a meticulously tuned instrument, encompassing perfectly both the comedic and tragic elements the play endeavors to include. The Cherry Orchard is by Anton Chekhov, with a new version by Stephen Karam. Directed by Simon Godwin. Set Design is by Scott Pask, Costume Design is by Michael Krass, Lighting Design is by Donald Holder, Sound Design is by Christopher Cronin, Movement Design is by Jonathan Goddard. Original Music is by Nico Muhly. The cast is Diane Lane, Chuck Cooper, Tavi Gevinson, John Glover, Celia Keenan-Bolger, Harold Perrineau, Joel Grey, Kyle Beltran, Tina Benko, Susannah Flood, Maurice Jones, Quinn Mattfeld, Peter Bradbury, Philip Kerr, Lise Bruneau, Jacqueline Jarrold, Ian Lassiter and Carl Hendrick Louis.